The German wild card defeated Kristina Mladenovic in three sets to win the 40th edition of the Porsche Tennis Grand Prix in Stuttgart. It was a thrilling final full of drama, and Laura Siegemund has fulfilled her dream. 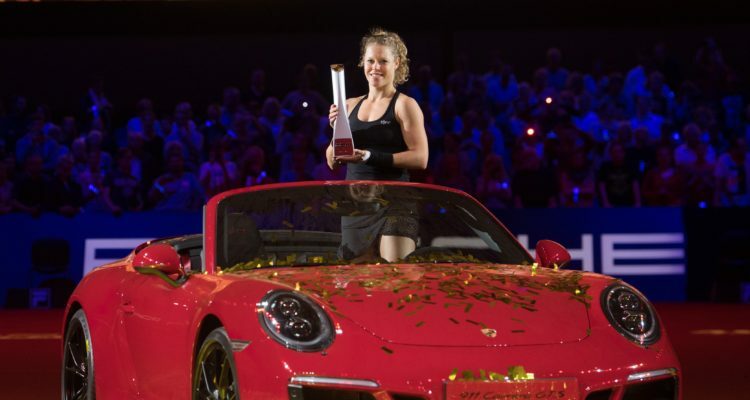 In beating Kristina Mladenovic 6-1, 2-6, 7-6(5), the Porsche Team Germany player won the 40th Porsche Tennis Grand Prix in front of a capacity crowd in the Porsche Arena on Sunday. Following on from Angelique Kerber’s successes in 2015 and 2016, a German player has now claimed the long-standing tournament for a third time in succession. Her biggest career achievement to date will catapult the local hero into the world Top 30. Before wrapping up the victory, Laura Siegemund had to dig very deep. The match was two hours 30 minutes old when last year’s runner-up converted her first match point. A short while later gold confetti rained down on her in the Porsche 911 Carrera GTS Cabriolet, the main prize for the winner of the anniversary tournament. Going into the final, Laura Siegemund, who was given a wild card entry, already had four long and hard matches in her legs and had beaten three Top 10 players en-route. Awaiting her in the final was the season’s in-form player Kristina Mladsenovic, who has won 22 matches on the tour this year and bagged the tournament in St. Petersburg. Laura Siegemund was not going to be overawed and took the first set 6-1 in just 28 minutes. The Frenchwoman who lives in Dubai, the doubles winner in the Porsche Arena in 2016, came back impressively in the second set – 6-2 for the world No. 19. The third set then lasted one hour 21 minutes and served up everything that the enthralled spectators had hoped for from the final. There were thrills a minute. It came down in the end to a tie-break which the Stuttgart-resident managed to close out on her first match point. The doubles title has gone to Raquel Atawo (USA) and Jelena Ostapenko (Latvia). They beat the No. 1 seeds Abigail Spears (USA) and Katarina Srebotnik (Slovenia) and were presented with a Porsche mountain bike in addition to the prize money. In its anniversary year, the Porsche Tennis Grand Prix once again supported charitable organisations promoting children’s welfare all over the world. For every ace hit during the week, Porsche donated 200 euro as a part of the “Aces for Charity” campaign. Up to the final, 179 aces were hit during the tournament week – and Porsche immediately rounded the 35,800 euro sum up to 40,000 euro. The donation was split equally between the Agapedia foundation and Plan International – the charity partners of the Porsche Tennis Grand Prix. The checks were handed over by Lutz Meschke, Deputy Chairman of the Executive Board and Member of the Executive Board, Finance and IT, on Sunday ahead of the final in the Porsche Arena. This entry was posted in WTA Premier Stuttgart and tagged Laura Siegemund, Porsche Tennis Grand Prix, WTA.